The industrial catalyst market was worth USD 17.15 Billion, in 2014, expected to register a CAGR of 4.2% between 2015 and 2020. In this study, 2013 has been considered as the historical year and 2014 as the base year for estimating market size of industrial catalyst. Industrial catalyst is widely used in petroleum refining, chemical synthesis, and petrochemicals. Different secondary sources such as company websites, encyclopedia, directories, and databases have been used to identify and collect information useful for this extensive commercial study of the industrial catalyst market. 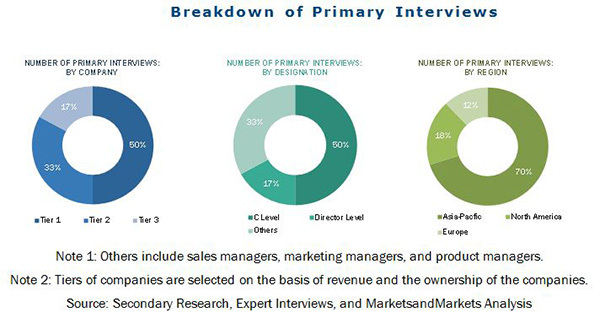 The primary sources, which include experts from related industries, have been interviewed to verify and collect critical information as well as to assess the prospects of the market. The top-down approach has been implemented to validate the market size in terms of value and volume. The exact values of the overall parent market size and individual market sizes have been determined and confirmed in this study with the data triangulation procedure and validation of data through primary interviews. The industrial catalyst market has a diversified and established ecosystem of its upstream players such as the raw material suppliers, and the downstream stakeholders such as manufacturers, vendors, end users, and government organizations. The major raw material suppliers are Zeolyst International, W.R. Grace and Co., Anten Chemical Co., and KNT Group, which supply raw material such as metal, chemical, zeolites, and organometallic materials to the industrial catalyst manufacturers such as Albemarle Corporation (U.S.), BASF SE (Germany), Clariant AG (Switzerland), and AkzoNobel N.V. (The Netherlands), The DOW Chemicals Company (U.S.), among others. This study answers several questions for the stakeholders; primarily, which market segments to focus on in the next two to five years for prioritizing the efforts and investments. These stakeholders include the industrial catalyst manufacturers such as the ExxonMobil Chemical Co. (U.S.), E.I DU Pont de Nemours & Company (U.S.), and Chevron Philips Chemical Company (U.S.), Arkema SA (France), and Evonik Industries AG (Germany), among others. This research report categorizes the market for industrial catalyst based on type, material, application, and region and forecasts revenue growth and analysis of trends in each of the submarkets. On the Basis of Type: The industrial catalyst market is segmented on the basis of type, such as heterogeneous and homogeneous. Each type is further described in detail in the report with value and volume forecasts till 2020. On the Basis of Material: The market is segmented on the basis of material, such as, metal, chemical, zeolites and organometallic materials. Each material is further described in detail in the report with value and volume forecasts till 2020. Metal and chemical are further classified and described in detail in the report with value and volume forecasts till 2020. On the Basis of Application: The market is segmented on the basis of applications that include Petroleum Refining, Chemical Synthesis, Petrochemicals, and Others. Each application segment is further described in detail in the report with value and volume forecasts till 2020. On the Basis of Region: The industrial catalyst market is segmented, by region, as Asia-Pacific, North America, Europe, and RoW. Each region is further segmented, by key countries, such as China, Japan, South Korea, India, the U.S., Mexico, Canada, Germany, Italy, France, the U.K., and Brazil. The industrial catalyst market size, in terms of value, is projected to reach USD 22 Billion by 2020, at a CAGR of 4.2%, between 2015 and 2020. The market, in terms of volume, is projected to reach 6,420.6 kilotons, by 2020, at a CAGR of 3.8%, during the forecast period. The increasing applications, growing manufacturing industries, increasing R&D activities, continuous expansion, and merger & acquisition activities undertaken by companies are key factors responsible for the growth of the industrial catalyst market. 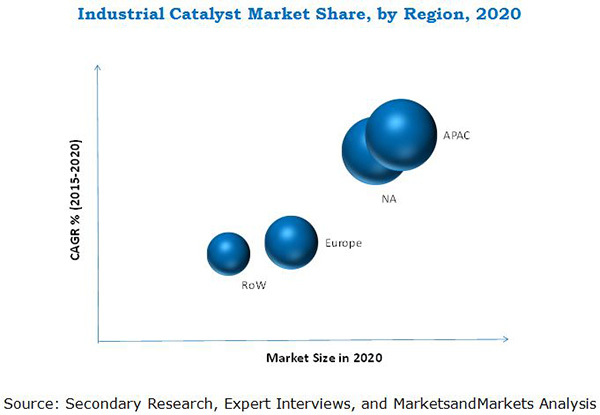 The heterogeneous catalyst are projected to be the fastest-growing type of industrial catalyst between 2015 and 2020. It is preferred by the major manufacturers owing to its characteristic of being easily separated from the products. Organometallic material is projected to register the fastest-growth among materials, followed by metals, in the market. Metal is the most preferred material used in the manufacturing of the industrial catalyst market. The demand for metals is mainly driven by to the growing application sector. Petroleum refining is the largest application segment in the market. The increase in refinery capacity and the demand for fuels have led to an increase in the use of catalyst in this application. The Asia-Pacific region, being the largest market for industrial catalyst is also projected to register a high CAGR in the industrial catalyst market, in terms of value, between 2015 and 2020. This growth is mainly driven due to an increase in the industrial catalyst demand in various application sectors, such as petroleum refining, chemical synthesis, and petrochemicals. Though the industrial catalyst market is gaining importance at a fast pace, a few factors act as a bottleneck toward the growth of market. The limited availability of industrial catalyst raw materials and higher production costs of industrial catalyst are major restraints toward the growth of the market. The technological advancements in chemical synthesis also reduce the demand of catalyst. The companies such as Albemarle Corporation (U.S.), BASF SE (Germany), Clariant AG (Switzerland), The DOW Chemicals Company (U.S.), ExxonMobil Chemical Co. (U.S.), E and Chevron Philips Chemical Company (U.S.), are the dominant market players in the industrial catalyst market. The diverse product portfolio and strategically positioned R&D centers, continuous adoption of development strategies, and technological advancements are a few factors that are responsible for strengthening the market position of these companies in the industrial catalyst market. They have been adopting various organic and inorganic growth strategies such as expansion, merger & acquisition, partnership, new product launch & product development to enhance their revenue in the market. This would help the market to evolve in further applications, which would, in turn, help them to expand their global reach.